The alleged thieves were remanded in bail till 29 December by Vavuniya district Judge M.Illancheliyan, legal sources said. The statue is 18" tall and 24kilo in weight. 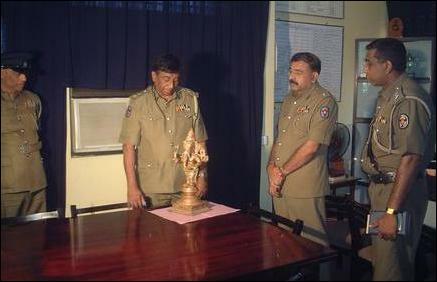 Vavuniya Senior Police Officer Miskin said that when he approached archeological experts to estimate the price of the Statue, he was told that since the Statue is very old it's irreplaceable and therefore priceless. When the Omanthai police questioned the suspects, they had said that the Statue was being taken to an address in Nellukulam in Vavuniya for cleaning. Followup investigations by Vavuniya Police revealed that there was no such cleaning service at that address and that the suspects were taking the Statue illegally for selling it in the black market.